Stand Your Ground, Jordan Davis, And Why Angela Corey Must Go! 1. Marissa Alexander. Marissa stood her ground in her home against an abusive ex-husband, who she didn’t shoot. Marissa fired a warning shot into the air. Marissa was convicted and sentenced to 20 years in prison. Thankfully the appellate court overturned that conviction. Doesn’t change the fact that Marissa, a Black woman, wasn’t able to stand her ground. 2. Trayvon Martin. Unarmed Black teen carrying skittles and a can of tea, gunned down by George Zimmerman because Zimmerman stalked him because he didn’t like the way he looked. Angela Corey wasn’t able to get a conviction here because the prosecution put on a very shoddy case. Zimmerman went free and Justice for Trayvon Martin was denied. 3. Jordan Davis. 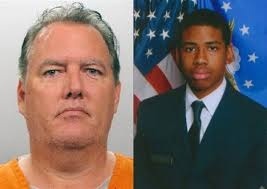 Michael Dunn murdered Jordan Davis in cold blood because he didn’t like the “thug” music he was playing. Again, Angela Corey was the prosecutor, and again, a shoddy case was presented. Although there wasn’t an acquittal, there was a mistrial. Thankfully Michael Dunn will go to prison. Not for murdering Jordan Davis, but for attempted murder of others in the vehicle with Davis. Justice for Jordan Davis is delayed. Notice the pattern here? Stand Your Ground works in Florida only if you are white or non-black, and the person you shoot and kill is Black. Sorry Marissa, you are Black so stand your ground doesn’t work for you in Angela Corey’s world. It was almost as if team Corey WANTED to lose the Zimmerman and Dunn trials. Did Corey not learn from the Zimmerman trial? Of course not. There was nothing for her to learn. She knows all too well what she is doing. As an elected official. Angela Corey needs to go. I hope voters remember this at election time. The fact that Angela Corey is Republican brings a lot of questions to my mind, starting with: Exactly what is her connection to the NRA, the group that wrote the Stand Your Ground Law. What Angela Corey is telling the non-blacks in Florida, at least in her area of Florida, is that it is ok to shoot and kill young black men, and if you are Black, you have no right to protect yourself.